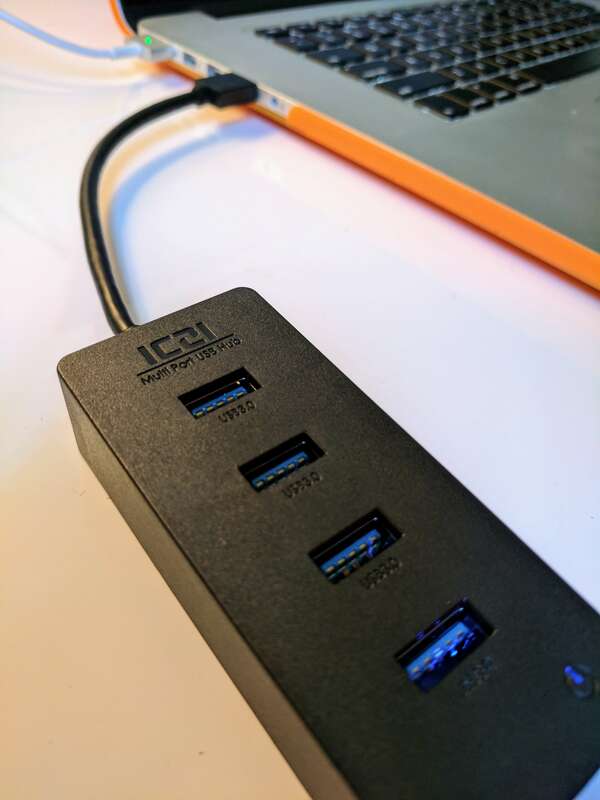 Having used the ICZI 4-Port USB hub for the past few weeks both at home and on the road, I have no hesitation in recommending it. For the price, you get outstanding performance at a great price. No it isn’t the most beautiful hub you will find on the market but if you are looking to get the job done by connecting multiple USB devices to your Mac, PC or Chromebook, it’s hard to pass up this one. When it comes to multi-port USB hubs, especially those that support the 3.0 standard, it is a mixed bag. Often you can find them at a low price but only one or two of the ports will support 3.0. The others are only 2.0. Or, the other side of this coin, is that you have one that supports 3.0 across all the ports but it comes at a steep price. Enter ICZI. The China-based manufacture has long produced accessories for smartphones and laptops and one of their latest offerings is a 4-Port USB 3.0 hub. Not only does it support USB 3.0 across all four ports of the hub, it comes in at just under $13 on their Amazon storefront. Recently the ICZI team sent me one of these hubs to review and after using it on my MacBook Pro for the last couple of weeks, I’m impressed. It’s a solid performer… no, an excellent performer, with backlit USB ports and a compact, if not utilitarian design. The ICZI A64 4-port USB hub measures 4.72 x 1.5 x .87 inches (L x W x H) and weighs in a 1.96 ounces. Thats 12 x 3.8 x 2.2 cm in new money with a weight of 55.5g. It is constructed of black ABS thermal plastic with the four USB port lined up across the top. The USB 3.0 connector from the hub that you connect to your PC or Mac measures 7″ in length so you can plug it into a USB port on your device and move it around to a position that works best for you. The USB ports themselves all support high speed 3.0 transfers. That means you can get up to 5GB of throughput depending on the devices connected. It is, of course, backwards compatible with 2.0 devices and slower speed 3.0 devices. Behind each port, and a small indicator on the top, there are blue LED lights to let you easily find the ports in low light situations. This is quite and adds a certainly aesthetic appeal to the hub. The ICZI A64 4-port USB hub, from a design perspective, isn’t going to win any awards. It is very utilitarian in its design but truthfully, who cares? It gets the job done and that’s really what’s important. In my testing of the hub for this review, I connected it to both a MacBook Pro 15″ (2016) and an Acer Chromebook 14. Both of these devices support USB 3.0 through their USB ports so I wasn’t going to be limited in throughput. I connected a wide range of devices to the hub, some by themselves and others in tandem, and all performed well. I connected my Western Digital Passport 3GB backup drive to it for example and doing a Time Machine backup of my Mac took just minutes to perform on 100GB of data. I was also able to connect my Google Pixel to the hub and transfer photos and files from my phone to my Mac almost instantly. Testing on the Chromebook was a bit different as there is virtually nothing stored locally on that device so there was no point in testing the hard disk. Instead, I connected up an Microsoft mouse and keyboard to use externally. While these were 2.0 accessories, they performed without any hesitation or lag when typing or moving the mouse around the screen. Throughout the usage and testing, the ICZI hub did not get overly warm during usage. The Hub is available from the ICZI Amazon store front for $12.99. For those of you who are Amazon Prime customers, shipping on the hub is free. ICZI backs up the hub with a 24 month warranty.